The development or acquisition of language separates the human being from any other mammal, enabling him to efficiently communicate and socialize with every other member of the same race. Thus,acquiring and developing this form of communication is crucial not only for means of transporting meaning itself, but for ensuring the human race to exist. Under normal circumstances every child can acquire every existing language, depending on it’s surrounding (cf. chapter two). Normal circumstances imply medical, cognitive and social parameters; if these three determining factors play together typically, a child may acquire a language in a stage-like order. In each stage, fundamental elements (or rules) of language are being learned (e.g. phonology, morphology, prosody etc.). In case of an autism spectrum disorder, one or more of the three determining factors is deficient - hence the acquisition of language deviates from its typical course. As will be described in chapter one, the actual type of autism plays a pivotal role in how problems in language acquisition will manifest: e.g., children with Asperger syndrome or some other type of high-functioning autism will be more likely to have problems in Pragmatics, whereas children with low-functioning type of autism may be challenged with producing language at all. 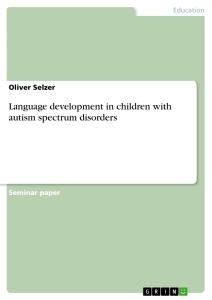 Hence in this paper, I will examine this deviant development by looking closely into the fundamental rules of language in “typical” and autistic learners. I will introduce very basic knowledge on medical, cognitive and social impairments autism spectrum disorders may consist of; then, the above mentioned comparison of fields of language will be conducted. Chapter four will conclude with prospects on therapeutics and teaching, introducing concepts and constructing possible classroom intervention. In the early days of research, parental failure was believed to be the prominent factor, too; but “new” family models (single parents) or anti-social parenting have soon been disproved. Yet while tracing the causes of the condition, the classification of it appears to be easy: on a global scale, autism spectrum disorder can be characterized as a variety of neurological disorders, followed by mild to severe social impairments, communicative limitations and mostly repetitive behaviour patterns.2 However, as global as this generalization might be, the single case is not, as no two human beings with an ASD are equal. Because even though medical scientists are able to measure and interpret influencing values like IQ or other neurological factors, every case consists of a different “mixture” of impairments and disorders. Depending on the occurrence and severity of impairments, the American Psychiatric Association's Diagnostic and Statistical Manual of Mental Disorders (DRM-IV)3 assigns either a low-functioning or a high- functioning form of ASD. As the names imply, the disorders and the resulting impairments can be very grave, resulting in poor cognitive, communicative and social abilities (see also Rett-syndrome); on the other hand, the dysfunctions may be very marginal, with near-to-no effects on the person itself or even empowering him to sheer implausible cognitive outputs: so-called “(idiots) savants” memorize absurdly long numbers, have a photographic memory or remember whole books. This range of possible “pictures” an autistic disorder may paint makes for the term “spectrum” in ASD: because the above mentioned triad of impairments4, not only extreme cases (see above) are existent, but also “intermediates” with a high variability in the clinical picture. While it is hard to selectively distinguish the exact form of ASD, there are phenotypic abnormalities that all cases have in common, varying only in the degree of influence. Most universal and most noticeable is their lack of “social competence”: this ranges from inability to maintain eye contact, reacting to their own name (also: reversing pronouns) and not being able to take turns in a conversation. In research, these factors have shown to be part of what is called the “Theory of Mind.” (ToM) WHITEN states that “[ a] theory of mind remains one of the quintessential abilities that makes us human. “ 5 By this theory, all actions of a human being happen out of mental states, e.g. emotions, beliefs or intentions. An individual reflects on the content of these stages in himself and in others; this “foreseeing” facilitates so-called turn-based conversation and enables humans to develop symbolic patterns. Thus, a lack of this ToM results in a kind of anti-social behaviour that facilitates isolation, the most common social impairment of people with an ASD. As this first chapter introduced basic knowledge regarding ASD and their phenotypic impairments and disorders, the following section will try to describe the complex of language and thus give a basis to discuss language alterations in autism in chapter three. The origin of language has long been discussed in science, with many definitions emerging from different theoretical onsets dealing with the functioning of the human being: empiricism on the one hand and rationalism on the other hand. In the former approach, knowledge (i.e. language, too) is believed to be acquired externally, whereas the latter supposes predetermined biological processes to exist that regulate knowledge acquisition. With special emphasis on language research itself, three schools of thought9 have emerged from the rationalist ideas: the first group believes language to be an innate skill that can evolve without influence from the environment. The second approach fosters a socialist view where language can only develop in an active and dualistic (two-sided) exchange with the “other”; this “other” is essential for cognitive functioning, with language being a typical feature of it. The last school of thought opts for an integrationist view, which believes the motor aspect to be the crucial element in language development; the experience with the social surrounding influences the cognitive functioning as well, but here, language itself is a nature of it. Gender and Emotional Language in Children's TV Series. An Analysis of "Avatar: The Last Airbender"